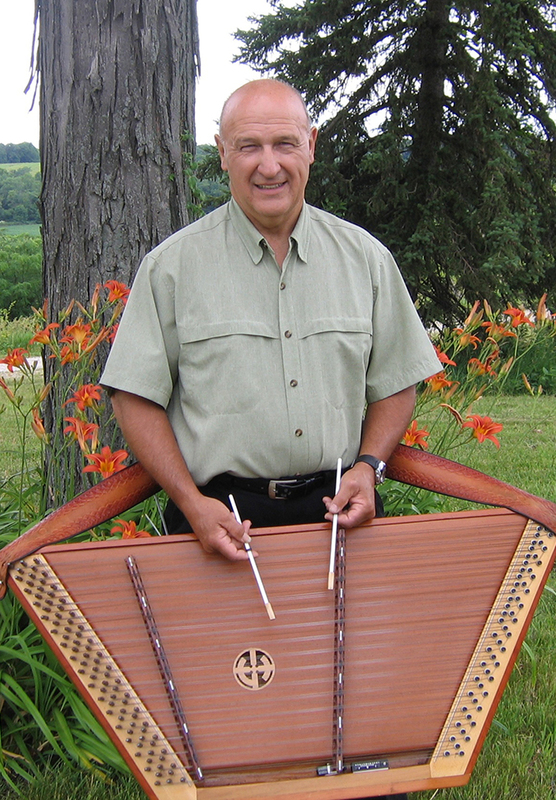 Bill Robinson is a 3rd generation hammered dulcimer player living in St. Charles, Illinois. Known for his upbeat playing style, and unique dulcimer traditions handed down from generation to generation, Robinson is a master of the instrument.. The hammered dulcimer, not to be confused with the Appalachian dulcimer, is a trapezoidal instrument in which strings are stretched across and then struck with small hammers to generate sound. It is rich in history dating back over 2000 years. During the 1800's, it was popular in the United States, but was all but extinct by 1930. Bill Robinson has been playing for over 60 years and formed the band Bill Robinson & Friends in 1980. He has also taught hundreds of students how to play the instrument and continues to teach new students. Programs and concerts can be tailor made to fit your schedule, needs and budget. Solo dulcimer is beautiful, and can also be accompanied by guitar and bass fiddle. The full scale band is perfect for concerts and large parties.